When a child is born with microtia, parents can feel fear, anxiety and, uncertainty. So much is unknown and parents often worry for their child’s future. After experiencing a variety of emotions and making the decision to move forward with ear reconstruction surgery, parents can once again face the emotional turmoil of their child returning to school. Most children begin ear reconstruction surgery between the ages of 5 and 7. Some have already been to school, while others have not. 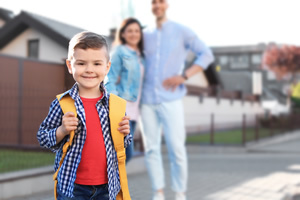 Children who have been to school may have an easier time returning because, while their microtia surgery may not be complete, they have been through the experience of being surrounded by their peers before. Children who have not previously attended school may be more aware of their ears since the adults around them have been very focused on them. When the grown-ups around them are focused on their ears, kids may be even more acutely aware of the differences between themselves and other children. “My son, Ethan, was excited to start school and be with other kids. We tried to downplay the surgery in the hope that this would allow him to not ‘feel’ different from other children. He’s aware of his ‘baby ear,’ but usually just tells other kids we’re fixing it,” said Carrie S. of Birmingham, AL. “Many parents explain the ear reconstruction process as the doctor simply fixing something like a broken bone. Because the surgery is a four-step process, it needs to be carefully explained to children. When both the parents and the child are comfortable, educated, and fully understand ear reconstruction, the entire process is much easier,” explains Dr. Mark Mitchell Jones of Atlanta Plastic Surgery Specialists. Resources for microtia include support groups, books, and websites/forums for parents and patients. Earcommunity.com offers support, resources, and information about surgery, technology, and your options. If your child was born with microtia, Dr. Mark Mitchell Jones of Atlanta, GA, is board certified in both ENT(ear, nose, and throat) and plastic surgery. Plus, he has performed hundreds of rib graft technique ear reconstructions. To learn more, view our “Guide to Microtia”, or simply call our office at (404) 355-3566 to schedule an appointment.